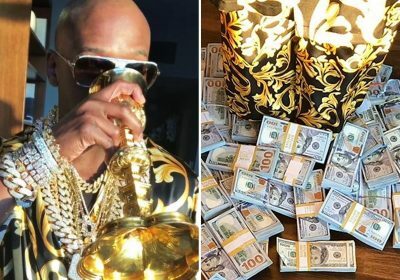 The retired boxing great, 41, was pictured standing in a pile of cash while drinking from a gold goblet and wearing millions of pounds worth of jewellery. Mayweather is believed to have pocketed as much as £67 million from his win over Japanese kickboxer Tenshin Nasukawa on New Year's Eve. And it's safe to say that the former five-weight world champion is now enjoying his retirement. In the clip, he wore a huge collection of gold and silver bracelets on both of his wrists and he had a huge diamond ring on his little finger. As the camera panned up and he drank from the goblet, he gave his fans a closer look at the collection of chains he had hanging around his neck. Speaking to his his 22.7 million Instagram followers, he captioned the post: "Real royalty. "Everything I got on is real, even the cup I'm sipping out of is real gold and if you don't like it… you're a REAL HATER. Now that's some real s***!" One of his fans commented: "Well done Mr Floyd. You deserve every penny that you have earned." While another cheekily asked: "Perhaps you should share some of that with your followers #nevergoingtohappen." Mayweather loves to splash his cash on expensive jewellery and he recently showed off his incredible collection of 41 watches – worth over £16m. And he gave his huge army of fans an insight into what a day in his life is like – which consisted of luxury cars, private jets and courtside seats an NBA game. But fans on social media were left in hysterics when he rocked up wearing a pair of red knee-length boots.